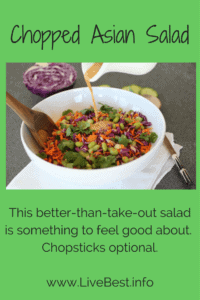 A healthy, vegetarian salad that is better-than-take-out! 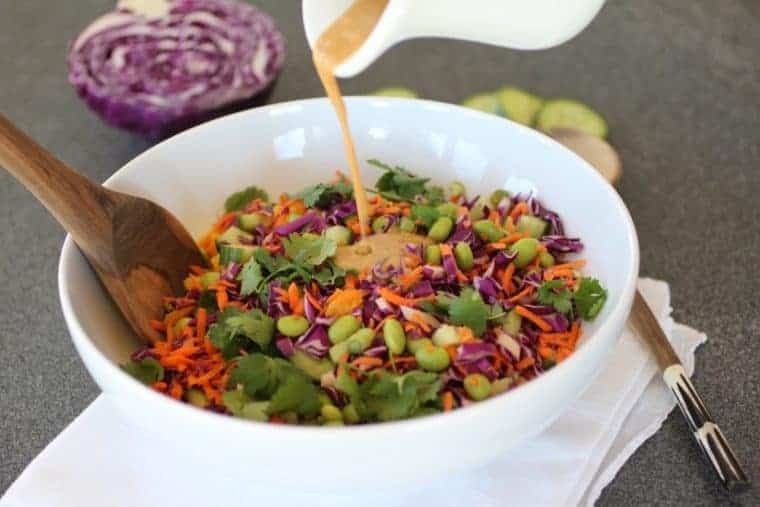 Asian Chopped Salad + Peanut Ginger Dressing, filled with gut-friendly, probiotic foods, is something to feel good about. Chopsticks optional. A familiar sign at the park or zoo, right? But personally you do need to feed the animals…the ones in your gut with probiotic foods. We have ten times more bacterial cells living inside us than we have human cells. They make up about 1 to 3 percent of our body mass (that’s about 2 to 6 pounds of bacteria in a 200-pound adult). They are on our skin, in our nose but most live in the GI tract that is about twenty feet long. These microbes are essential for health. They produce vitamins, break down food so we can extract the nutrients we need, teach our immune system how to recognize dangerous invaders and produce compounds that help fight off other disease-causing bacteria. The microorganisms, along with sleep and exercise, affect our digestion, regulate our metabolism, impact weight and optimize our brain. Each of us has a different mix of bacteria, which in turn influences our health. Food choices, physical activity, lifestyle, environmental factors, and even the way you were born, impact a person’s microbiota. Breastfed babies and those born vaginally seem to have a better bacterial mix. The National Institutes of Health is conducting a Human Microbiome Project looking at gut bacteria impact on health and disease. It’s not yet well understood but emerging research suggests that gut bacteria may play a role in developing diabetes, ulcerative colitis, Crohn’s disease, type 2 diabetes, obesity, cancer, allergies and rheumatoid arthritis. The bacteria that inhabit your gastrointestinal tract are picky. Certain foods help them thrive. Foods rich in fiber and plant compounds such as whole grains, fruits, vegetables, nuts, and legumes (split peas, black beans, pinto beans, and lentils) satisfy the gut bacteria. Fermented foods and those with live, active cultures such as yogurt, kefir, miso, kimchi, and unpasteurized sauerkraut and pickles (found in the refrigerated section at the grocery store) contain beneficial bacteria which helps keep the gut healthy. Feed the animals with probiotic foods that help them flourish, deliciously. More like what’s not to like? I think the flavors, texture, color are spot on for a salad. The vegetables hold up well (before adding the dressing) so you can chop once and eat throughout the week. If you want to make it more substantial, add cooked chicken, beef, or shrimp. 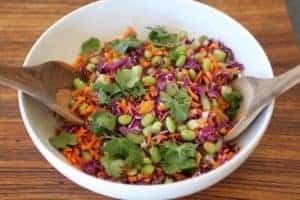 Enjoy this Asian Chopped Salad while you feed the bacteria in your gut. This better-than-take-out fresh chopped salad is something to feel good about. Chopsticks optional. A healthy, vegetarian salad that is better-than-take-out! 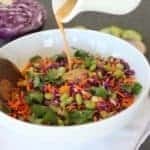 Asian Chopped Salad and Peanut Ginger Dressing is filled with gut-friendly foods so is something to feel good about. Chopsticks optional. Combine all dressing ingredients in a blender or food processer and blend until smooth. Assemble salad ingredients in a large bowl. Drizzle dressing over salad and toss to coat.